Last fall, Dr. David O’Hara offered students in his Ancient Philosophy class an optional field trip to Badlands National Park, a rugged stretch of some 240,000 acres in western South Dakota where age-old geologic deposits form jagged, mountain-sized ranges that rise up from the rolling prairie like magical pages in a child’s pop-up book. As he shared details of the outing with his class, he was quick to note that it wouldn’t be any ordinary field trip. He wasn’t requiring any papers and he wasn’t offering any class credit for going. And, most importantly, participants would need to bring sleeping bags. Fifteen or so students took him up on it, following O’Hara west on a Friday afternoon, over the Missouri River and just past the legendary Wall Drug and its free ice water. They set up tents in the Park’s primitive campground and waited. After the sun set and millions of stars debuted in the black, cloudless sky, O’Hara and his students simply looked up and watched. They saw the Big Dipper, witnessed the wonder of meteor showers, watched the Milky Way turn and saw Jupiter rise and cross the sky. Looking through an amateur telescope, they could make out four of the gigantic planet’s moons and watched angry weather patterns swirl over its surface. Despite having brought sleeping bags, most of them never went to sleep. For many of the students, the trip will likely go down as among their most memorable Augustana experiences. For O’Hara, it was a chance to see his students cultivate wisdom while utilizing the “Socratic Method” – a way by which individuals discover answers for themselves, first-hand. That love of wisdom, he says, is what philosophy is all about. O’Hara came to Augustana in 2005. He was born and raised in Woodstock, N.Y., (yes, that Woodstock) and says he knew he wanted to teach at the college level when he was in middle school. He enrolled in the “Great Books Program” at St. John’s College in New Mexico, a curriculum that includes no lectures, no exams, no grades and very few electives. There, he read and debated famous works by Aristotle, Freud, Newton, Einstein and others. He then went on to earn his Ph.D. from Penn State. His time at St. John’s, he says, continues to influence his teaching even today. But in a practical sense, it’s much more than that. It’s why O’Hara says the study of philosophy is not training for a profession. It’s training, he says, in life. After Augustana, philosophy majors take a variety of routes, O’Hara says. Many go on to medical, dental or law school. A number go into politics or into the study of politics. Others pursue ministry work, professional positions such as computer programming or business administration, or nonprofit work. In Augustana publications that feature current students and their experiences, a large number list O’Hara as among their most inspiring and influential professors. They have said the door to his office, a room lined with books and comfortable chairs, is always open; his tea kettle is always ready; and his ear is always willing to listen. His work extends off campus as well. During his time at Augustana, O’Hara has led six study abroad courses in Greece, (which have included stops in other countries such as Holland, Italy and the United Kingdom) and has co-led courses in Nicaragua and Guatemala. His students’ education is something O’Hara, 42, takes very seriously. The responsibility O’Hara feels toward his students, and his commitment to helping them learn is what makes him a great teacher, according to Dr. Murray Haar, professor and Chair of the Religion and Jewish Studies Department. In recognition of his efforts, O’Hara was named the recipient of the 2012 Vernon and Mildred Niebuhr Faculty Excellence Award, an honor that celebrates excellence in teaching and brilliance in the classroom. The award was presented at Augustana’s Commencement ceremony in May. For O’Hara, the awards and the praise are humbling. In the end, though, he considers himself the lucky one. “I have an amazing job,” he says, smiling. 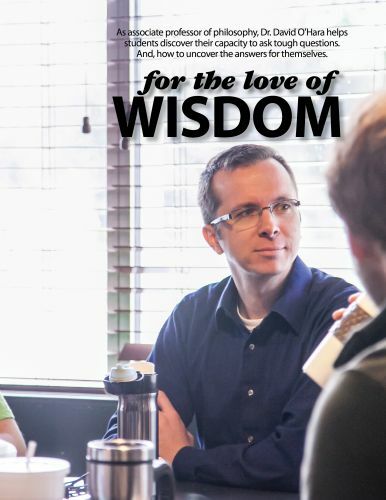 Learn more about Religion, Philosophy & Classics at Augustana.